Lawmakers in Raleigh passed bipartisan legislation at the end of June giving more authority to cities and counties to relax certain prohibitions on the sale of alcohol. Senate Bill 155, the culmination of months of work, is catch-all legislation reforming more than a dozen alcoholic beverage control (ABC) laws. The final bill combined three different pieces of legislation, including House Bill 500, focusing on craft breweries, and House Bill 480, a tax compliance bill aimed at helping craft brewers. But the main focus ever since the bill was proposed has been on a provision that enables local governments to pass their own resolutions, if they so choose, allowing restaurants, bars, hotels, and retail outlets (such as grocery stores) to begin selling their normal offerings of alcohol products (beer, wine and/or cocktails) beginning at 10 a.m. on Sunday mornings instead of at 12 noon. The “brunch bill,” as it is often called, represents the latest reform to the state’s long-standing ban on Sunday morning alcohol sales. The legislation’s supporters hope to see a significant bump in summer sales (and tax revenues) as a result. The limitation on Sunday sales was originally enacted in deference to morning church-goers as part of what are known as “blue laws” — referring to the colored paper they were once printed on — which were put in place to acknowledge that Sunday should be set aside for worship. Blue laws go back to the time before the founding of our republic. More recently, North Carolina’s “Sunday Closing Laws” were instituted in 1961 to restrict even general commerce on the Christian holy day. It was later overruled by the state Supreme Court as being too vague and inconsistent. Other laws have been instituted over the years restricting Sunday alcohol sales. Originally, the prohibition extended to the entire day; in 1981, a law was passed to allow Sunday alcohol sales to start at 1 p.m.; in 1993, sales were permitted to start at 12 noon. With passage of this year’s reforms, unless local governments vote to change the time to 10 a.m., alcohol still cannot be purchased between 2 a.m. and noon. North Carolina’s ABC stores will continue to remain closed on Sundays. 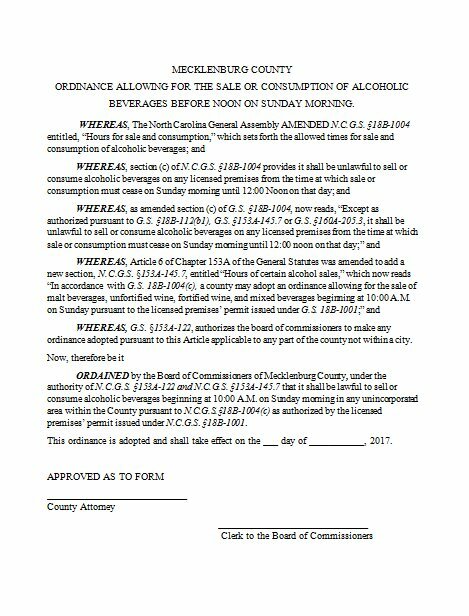 With the Senate Bill 155 now law, North Carolina joins 47 other states that allow some form of Sunday morning alcohol sales. The bill was signed into law on Friday, June 30, and went into effect immediately as a local “opt-in” law, shifting the responsibility to city and county governments which must now pass local resolutions authorizing Sunday morning sales in their communities. A local resolution of this nature would constitute what’s called a “police power ordinance,” and local governments can pass such resolutions without holding public hearings (which are permitted but not required). Under General Statute 160A-191, cities are required to hold public hearings only when passing ordinances that restrict business activities on Sunday, but not for ordinances that expand them — which the “Brunch Bill” clearly does. Many of North Carolina’s municipalities have already shown an interest in passing local “brunch bills” and the new law has sparked a Twitter advocacy campaign with the hashtag #FreeTheMimosa. Fayetteville. Fayetteville has put a measure on its August 3 agenda and Mayor Nat Robertson says he hopes to have it legal there by September 1. “It’s common sense to me,” Robertson said. Raleigh. On June 30, News & Observer reporter Andy Specht Tweeted about Raleigh’s interest in getting a head start: “I asked Mayor Nancy McFarlane when the Raleigh City Council might vote to allow early Sunday alcohol sales and she said, ‘As soon as we can! !’” How soon is now? Raleigh’s city council voted 7 to 1 on Wednesday, July 5, to allow Sunday morning alcohol sales, CBS North Carolina reported. So far, many of the state capital’s restaurants are getting on board. Surf City. The coastal town of Surf City announced the passage of its brunch bill resolution on July 5. Some municipalities are not so enthusiastic, however. Nags Head commissioners took up a brunch bill proposal at their July 5 meeting and voted it down with a 2-3 vote, the Outer Banks Voice reports. Instead, the board opted to hold a public hearing at their August 2 meeting before taking a final vote on the matter. Distilleries can sell up to five bottles of spirituous liquor per year at the distillery to consumers who takes a tour of the distillery. In 2015, Gov. Pat McCrory signed House Bill 909 into law which allowed distilleries to sell each customer one bottle per year. North Carolina already has 45 operating distilleries and 22 more in the pipe, according to The North Carolina Distillers Association, which has spent years asking the state legislature to reform the Prohibition-era regulations on distilleries. Homebrew competitions are now expressly legal.